<h2>To reduce food waste, scientists are making labels that track produce as it spoils</h2><br /><p>According to a <a href="http://www.eu-fusions.org/phocadownload/Publications/Estimates%20of%20European%20food%20waste%20levels.pdf" target="_blank" rel="noopener noreferrer">study conducted in 2016</a>, an estimated <a href="http://www.eu-fusions.org/phocadownload/Publications/Estimates%20of%20European%20food%20waste%20levels.pdf" target="_blank" rel="noopener noreferrer">88 million tonnes of food waste</a> is produced in the European Union annually – equivalent to about 173kg per person. An estimated 60% of the food thrown away in households is edible while in the wholesale and retail sector that figure increases to 83%.</p> <p>One key reason for this waste is the concern that surrounds use-by dates on the packaging, which were introduced as an important safety measure to prevent customers being sold and eating food that might be unsafe to eat. But more than a fifth of still-edible food is unnecessarily discarded due to date inaccuracies or <a href="http://www.europarl.europa.eu/RegData/etudes/BRIE/2015/548990/EPRS_BRI(2015)548990_REV1_EN.pdf">confusion</a> about what the dates actually mean. For instance, many Europeans <a href="https://ec.europa.eu/food/safety/food_waste/eu_actions/date_marking_en">confuse best-before dates</a> – a recommended consumption time frame for when a product is freshest – with expiry dates.</p> <p>Food labels don’t reflect the different conditions of how a product is stored as it is transported to a shop and ultimately to a consumer’s home, according to Solveiga Pakštaitė, founder of Mimica, a company based in London, UK, that is leading a project to produce more accurate food spoilage indicators.</p> <p>‘Suppliers tend to build in a margin of error to mitigate the risk of the cold storage chain being broken,’ she said. ‘It means that if the supply chain works perfectly, perishable products are going out of date and being thrown away before they have actually spoiled.’</p> <p>Pakštaitė and her team want to tackle food waste with a new type of label. They have produced a tactile indicator that changes with the freshness of the food.</p> <p> <div class="quote-view quotesBlock quote_horizontal"> <div class="quotesTop"><img src="https://horizon-magazine.eu/sites/all/themes/horizon/images/quotes_top.png" alt="" title="" /></div> <p>'As I researched expiry dates, I realised that we are all sort of blind to food when it goes off. We rely on the expiry date that often tells us little about what is happening to the food inside the packaging. '</p> <blockquote><p>Solveiga Pakštaitė, founder of Mimica</p></blockquote> <div class="quotesBottom"><img src="https://horizon-magazine.eu/sites/all/themes/horizon/images/quotes_bottom.png" alt="" title="" /></div> </div> </p> <p>The label contains a thin layer of gelatine containing biologically active ingredients that mimic what happens to the food it is attached to. As the food decomposes the gelatine breaks down, revealing a bottom layer that is bumpy to the touch.</p> <p><strong>Bumpy labels</strong></p> <p>‘The idea initially came from thinking about how visually impaired people cope with expiry dates on food,’ Pakštaitė said. ‘They have no way of seeing the date printed on the side of the packaging so often they choose foods that are processed and tinned because they don't go off as quickly. This means the food they eat isn't very healthy. So I wanted to come up with a solution that could help them.</p> <p>‘But as I researched expiry dates, I realised that we are all sort of blind to food when it goes off. 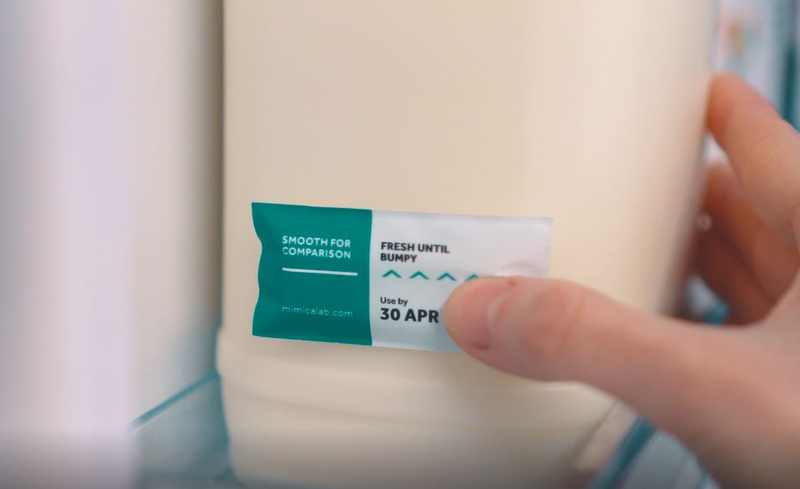 We rely on the expiry date that often tells us little about what is happening to the food inside the packaging.’</p> <p>Danish dairy giant Arla is carrying out consumer tests in the UK of the new&nbsp;label&nbsp;on the lid of its milk bottles&nbsp;in an attempt to gauge market reaction. If successful, the Mimica Touch labels&nbsp;will be rolled out in supermarkets in the country later in the year, before perhaps appearing elsewhere in Europe.</p> <p>Pakštaitė hopes the labels could also be used to help consumers gauge the freshness of other products such as meat and eggs. She says that temperature changes make eggs spoil, which is why – to avoid these fluctuations – people are encouraged to store them in the fridge.</p> <p>‘But often you don't know until you crack them open. Our labels could really help to show what condition the eggs are in,’ she said, adding that they hope to next work with meat.</p> <p>Although Pakštaitė will not reveal exactly how they calibrate the gelatine to decompose at the same rate as the food it is labelling, she says it has to be altered for each product based on laboratory testing and mathematical modelling.</p> <p><strong>Wireless sensors</strong></p> <p>Pakštaitė says that using a tactile expiry label is a cheaper option than using colour-changing labels, which can require expensive pigments and inks, or sensors that look for markers of decay.</p> <p>But one disadvantage of their label is that it is only mimicking the decline in freshness of a product rather than directly sensing it.</p> <p>This is the approach that another ambitious project, called GLOPACK, aims to take with wireless chips embedded in the labels, which they are currently developing.</p> <p>The international collaboration, which is being coordinated by researchers at the University of Montpellier in France, is attempting to address several forms of waste associated with food.</p> <p>As food spoils, bacteria growing on it will release carbon dioxide into the container along with ethanol and aromatic molecules. Using a plant-based sensor that can detect changes in the gases given off by food, the labels could then give a much more up to the minute indication of how fresh food is.</p> <p>The researchers behind GLOPACK intend to use wireless radio frequency identification (RFID) tags embedded in the label to transmit the information to devices like a mobile phone. These tags do not require a battery and would be coated in a layer of plant-based proteins that will emit a weak electrical signal when the gas inside the package changes. This would transmit information about the change in food freshness to the RFID tag and to a contactless reader.</p> <p>The idea is to allow customers and supermarkets to quickly and accurately assess the state of individual products.</p> <p>‘Being able to monitor products accurately in this way would show what the real freshness of the food is and help to reduce the amount customers and companies are throwing away,’ said Veronika Peciarova, manager of the GLOPACK project at the University of Montpellier. ‘Food is often wasted because people are looking at the expiry date, which doesn't always mean that the food cannot be eaten past that date.’</p> <p><img class="@alignleft@" title="Researchers working on a project called GLOPACK are developing different solutions to tackling food waste such as these biodegradable food trays. 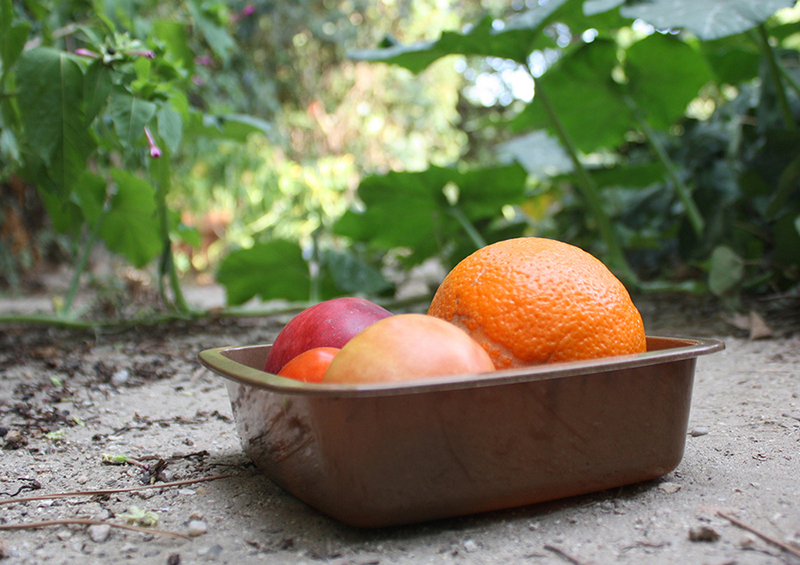 Image credit - GLOPACK" src="https://horizon-media.s3-eu-west-1.amazonaws.com/s3fs-public/IMCEUpload/EcoBioCap_crop.jpg" alt="Researchers working on a project called GLOPACK are developing different solutions to tackling food waste such as these biodegradable food trays. Image credit - GLOPACK" width="900" height="636" /></p> <p><strong>Biodegradable packaging</strong></p> <p>GLOPACK researchers are also working on ways to increase the shelf life of food by modifying the atmosphere inside the packaging and introducing essential oils to help combat the bacteria that speeds up spoilage.</p> <p>They have also developed a new type of biodegradable packaging that could help to reduce the plastic waste that comes from the food industry. By mixing a biopolymer called polyhydroxyalkanoate (PHA), with leftover straw from wheat harvests and vine shoots, they’ve created thermo-moulded trays to be used for packaging meat and ready-to-eat foods like falafels. The team are now preparing to test the trays in the next couple of months to see if they will be acceptable to consumers.</p> <p>‘The biodegradable material is not transparent so we want to know if consumers will buy food if they can't see what is inside,’ said Peciarova. ‘We are hoping with all of these approaches, (that) we can reduce the environmental footprint of food.’</p> <p><em>The research in this article was funded by the EU. If you liked this article, please consider sharing it on social media.</em></p> <br /> <img src=”http://www.google-analytics.com/collect?v=1&tid=UA-40077089-1&cid=to-reduce-food-waste-scientists-are-making-labels-that-track-produce-as-it-spoils&t=event&ec=republish&ea=read&el=to-reduce-food-waste-scientists-are-making-labels-that-track-produce-as-it-spoils&cs=republish&cm=republish&cn=republish&cm1=1" /> This post <a href="https://horizon-magazine.eu/article/reduce-food-waste-scientists-are-making-labels-track-produce-it-spoils.html">To reduce food waste, scientists are making labels that track produce as it spoils</a> was originally published on <a href="https://horizon-magazine.eu/">Horizon: the EU Research &amp; Innovation magazine | European Commission</a>. ‘The idea initially came from thinking about how visually impaired people cope with expiry dates on food,’ Pakštaitė said. ‘They have no way of seeing the date printed on the side of the packaging so often they choose foods that are processed and tinned because they don't go off as quickly. This means the food they eat isn't very healthy. So I wanted to come up with a solution that could help them. ‘But often you don't know until you crack them open. Our labels could really help to show what condition the eggs are in,’ she said, adding that they hope to next work with meat.